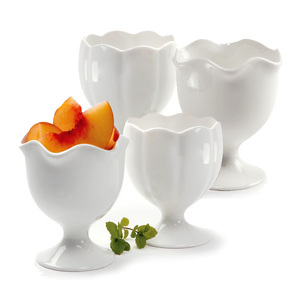 An elegant way to serve ice cream or fruit. Made of beautiful white porcelain. Set of 4, 2 of each style. 2 Ruffle Styles, 8 ounces. 2 Scallop Styles, 12 ounces. Each measures, 4.75"/12cm in height, approximately.